It’s hard to beat autumn in Montana. Sure, summer is amazing and never seems to last quite long enough but there’s something about the transition to fall that quickly makes us forget all about those long, warm summer days. Chilly mornings, flannel and fleece, painted fall foliage, bugling elk, brown trout on the prowl….what’s not to love? Come experience the best of what Montana has to offer. Book a trip with us this fall and we’re confident you’ll make autumn your go to time for Montana fly fishing. If you’ve got the time we encourage you to make it a multi-river trip with a day or two on the Mighty Missouri and a day on the Blackfoot as well. 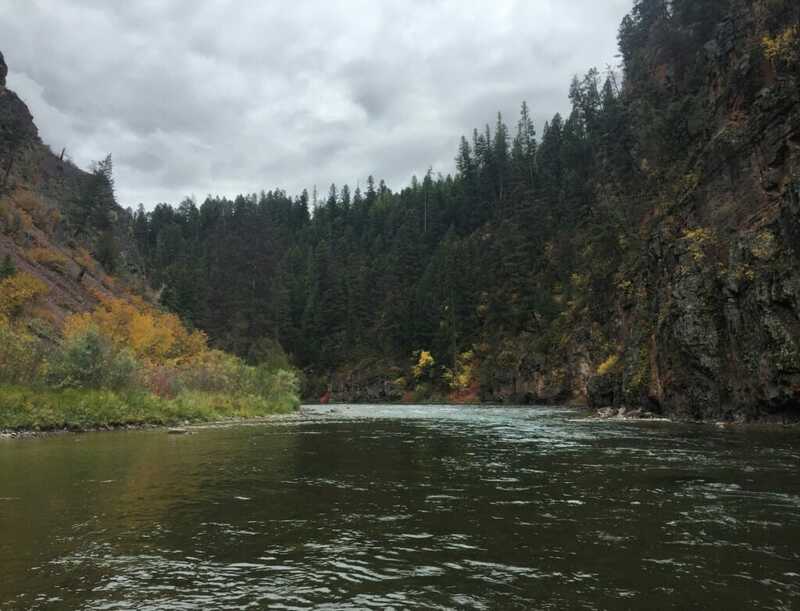 It’s just a short drive across the divide to the Blackfoot (less than two hours) but a full day on the water can make for a long drive back to Wolf Creek. Many don’t mind the trip but if you’d prefer we can get you set up with lodging in either Ovando or Lincoln. Maybe take a day off guided fishing to explore wade fishing opportunities on the Blackfoot before returning to Wolf Creek and the Missouri. If you’re strictly into numbers then stick to the MO’ but if you want to experience two completely different Montana fly fishing experiences then book them both. Our guides feel right at home on either. 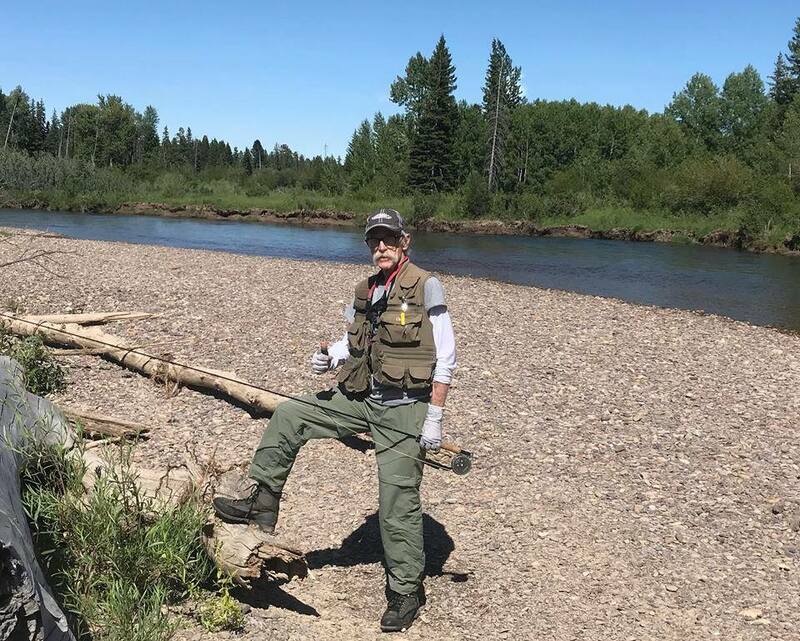 One of the drawbacks (if you can call it that) of owning and running a shop on one of the best trout rivers in the world is that you tend to miss out on a lot of other fly fishing opportunities on other waters. Let’s face it, there is no place like the MO so why would anyone want to go anywhere else? Well the short answer is that there is a lifetime and beyond of amazing trout water here in Montana and while our first love is definitely the Missouri we make no apologies for spending time exploring other rivers. One of these other rivers is just a short drive over the divide and offers a completely different experience than what we have here. 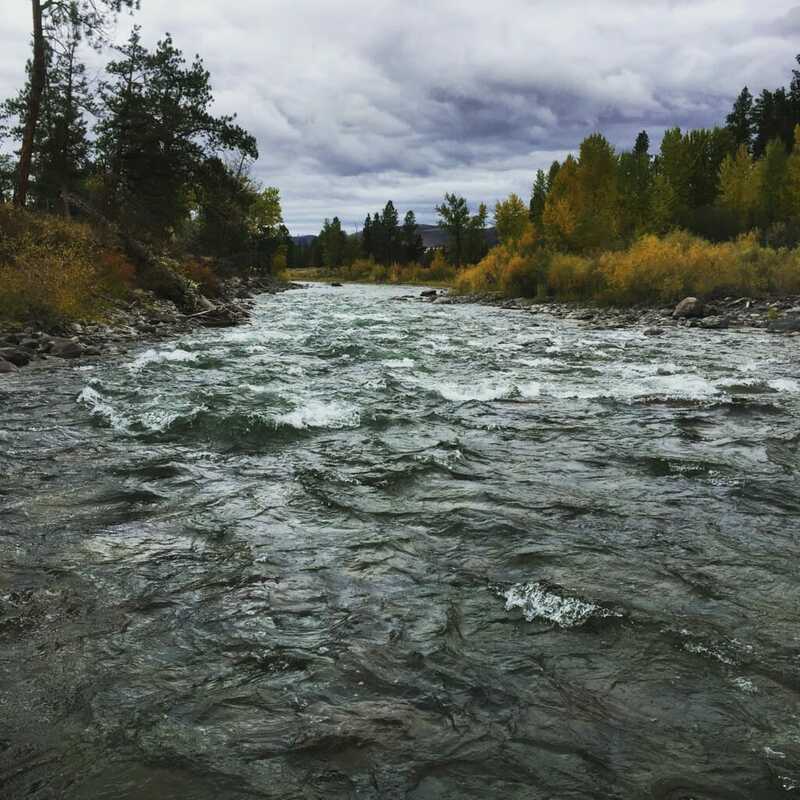 The Blackfoot River begins at the Continental Divide about 10 miles northeast of Lincoln and flows west 75 miles to where it enters the Clark Fork River just east of Missoula. Made famous by Norman Maclean’s 1976 novella “A River Runs Through It” and even more so by the 1992 movie of the same name, The Blackfoot is home to numerous species of fish including brown and rainbow trout as well as West Slope cutthroats, char and mountain whitefish. It is a classic freestone stream in every sense and while it’s just a short drive from the Missouri River it is a completely different world marked by mountains and wilderness and everything you might picture when you think of the classic Montana wilderness fly fishing experience. Don’t tell the MO’ but I have been in love with the Blackfoot since the first time I saw her and I am over there any chance I get. I’ve spent countless hours on the Blackfoot but up until last Thursday I had never floated this amazing river. It’s something I’ve been meaning to do since I moved to Montana but things being what they are, I just never made it over there with a boat and a full day to float the river. It took a visit from friends from Michigan to make it happen and now I am all that much more smitten. It is so worth your time to go experience a day on this water and while you won’t likely catch the quantity or size of fish you catch regularly on the Missouri, it’s an outing you won’t soon forget. Crystal clear water, deep blue pools, chutes runs and riffles, high canyon walls…the Blackfoot has all of this and cutthroats too! If you’re coming for a few days we highly recommend a day on the Blackfoot to go along with your days on the MO’. We’ve got expert guides for both and we would love to share this treasure with you. Ask about it when you call us to book your Montana fly fishing adventure. Like the view? Call Wolf Creek Angler and book your Missouri River Fly Fishing Guide Trip today. Prime dates are rapidly disappearing. Don’t put it off any longer, book your 2016 Missouri River Fly Fishing trip of a lifetime today. Lodging is nearing capacity for the months of June and July and it looks like we’re going to have a busy spring as well based on the amount of April and May bookings. We’ve got a bunch of guide trips already booked for June and early July but don’t despair, it’s not too late. We’ve still got plenty of guides and dates available. Looking for something a little different? Why not add a little variety to your trip and plan to do a day on the nearby Blackfoot or Dearborn Rivers in addition to the Missouri? The Dearborn season is early and short, usually just a couple of weeks depending on water levels, but if you can do a late May/early June trip chances are good we can get you on the Dearborn for a day.The Blackfoot offers the same wilderness, freestone experience but with a much wider window of opportunity. With legendary dry-fly fishing as well as nymphing and streamer fishing, an insane abundance of trout, ease of access and year-round opportunities, the Missouri will keep you coming back time and again but you owe it to yourself to try the quintessential Montana Wilderness fly fishing experience offered by these other rivers. You will likely catch more and bigger fish on the Missouri but you’ll never regret devoting a day to experiencing something so different from the Missouri. With the Missouri just minutes away and miles of other phenomenal trout waters within easy reach, Wolf Creek Angler is your base camp not just for the Missouri but for Montana fly fishing period. Many of our guests stay for a week or more at a time and fish the Missouri hard but also venture off to explore the surrounding waters. We encourage you to arm yourself with a can of bear spray and a gazetteer and spend a day or two exploring the blue lines. The shop of course caters to the Missouri River fly-fisher but we can also get you set up for fishing the smaller waters. We’ve got the rods and reels and lines, the wading staffs and hand nets; the maps and the knowledge and of course the bins full of foam and the BIG DRY FLIES which are a staple of freestone fly fishing and we’re happy to get you pointed in the right direction. 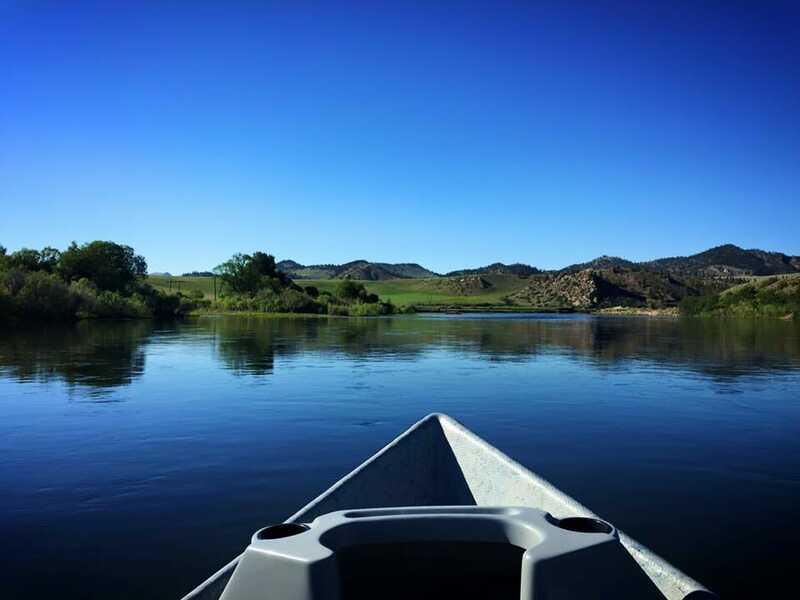 No matter your water preference, we would love to have you as our guest at Wolf Creek Angler this season. Give us a call today and let us help you plan your Montana fly fishing dream vacation on the Missouri River and beyond. Stop dreaming and start planning. Call the dream vacation HOTLINE at 800-800-4350 and book today.